TRIVIA of Noh : Q31 : When did kagami-ita, the symbol of the Noh theatre, first appear? | Home | Trivia | Q31 : When did kagami-ita, the symbol of the Noh theatre, first appear? When did kagami-ita, the symbol of the Noh theatre, first appear? Noh plays are performed not only in Noh theatres but in various other styles of stage. On some occasions, a planked stage is specially prepared in a large theatre hall. On other occasions, a temporary open-air theatre is built. Some people may be concerned about the differences between such temporary stages and full-fledged Noh theatres. 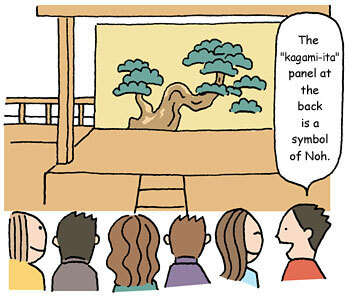 When they find, for example, that the temporary theatre is not provided with the back wall, or kagami-ita, they may feel that they need the kagami-ita, on which an old pine tree is painted, because it is the very symbol of the Noh theatre. However, the kagami-ita was actually first introduced in the Momoyama period (late sixteenth century), or even later. The Noh theatre of ancient times changed form many times, and in some periods the stage had an opening on each side of the square – this style was called shihō-shōmen (four front sides) – and there was no wall behind the stage or the gangway bridge. On such stages, actors seemed as if they were floating in transparent space, and they could point in any directions. There are various views regarding why kagami-ita became widely used. One view suggests that the reflection from the back wall improved the acoustics, while the other suggests that performers tried to narrow the auditorium in order to refine the effect of the stage. Noh has a power of vivid expression in its nature, and actors with genuine skills can describe the scenery of pieces from any direction. Noh plays performed outside of Noh theatres will bring you chances to encounter the vitality of the Noh art.